Monday a package arrived in the mailbox. 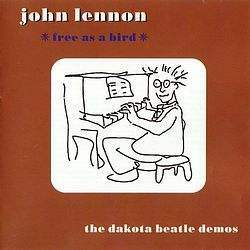 On Thanksgiving Day I had placed a bid on a bootleg John Lennon CD entitled Free as a Bird: The Dakota Beatles Demos, won it that day, and made a nearly immediate payment through PayPal. And Monday it was mine. It had been a tiring few days at work. Twelve-hour shifts on Sunday and Monday which followed on the ten-hour shifts on Black Friday and Saturday. It wasn’t just the Christmas shopping season that necessitated the hours. There was the imminent visit by the regional vice president on Tuesday that mandated the store receive a thorough rework and cleaning. With nothing more that could be done on Monday and my eyes near the bleeding point, I went home to regroup and recharge, fresh to attack the challenges that Tuesday would bring. And there was the package in the mailbox awaiting me. I wanted to go to bed. I should have gone to bed. But the prospect of hearing the John Lennon demos that were cleaned up and reworked by the remaining Beatles in 1995 was too thrilling to comtemplate anything other than putting the CD in the stereo for a spin and giving it at least one listen. These are demos, not songs. As such they’re incomplete, like looking at a writer’s notebook. Most of the tracks are simply John Lennon playing either a piano or a guitar. “Free as a Bird” is unfinished and aimless, more of a chorus or middle-eight to another song than a song in itself. “Real Love” shows the most promise, which is why it was the most successful creatively of the two Beatles reunion tracks; it was the song that had probably come nearest to completion but hadn’t actually been recorded properly by Lennon before his death. “Now and Then,” rumored to have been the third choice of the Beatles for reworking, simply wouldn’t have worked; the song is tuneless, the lyrics pointless, and a pervading hum infects the track which probably could not have been corrected or cleaned without destroying Lennon’s vocal. Other tracks show how unfinished these demos were. Some contain snippets of lyrics from songs from Double Fantasy, Milk and Honey, or even “Real Love,” while others contain passages of music that ended up elsewhere. Of the tracks on the album, “Free as a Bird” and “Real Love” are the most important as they illustrate the work that the remaining Beatles and Jeff Lynne put into the demos to make them functional songs. I wish that these two tracks, along with John Lennon’s demo of “Child of Nature,” had appeared on the Lennon Anthology boxset of a few years ago, because the final versions of the songs are well-known, but there’s much to be gleaned from studying how the songs evolved from their original to the finished form. Doug, why aren’t you in school? Previous Previous post: I am Spartacus!